I pulled off at the Walmart in Kittanning, Pennsylvania last night, about an hour or so away from my starting point today in Ligonier. One of the back roads to my destination was closed; so ,Gina, my GPS found an alternate route. As I was following this route, the car in front of me stopped on the road. When I began to pass her, she waived me down. I couldn’t figure out what she would want except to ask about VANilla, since my van seems to get a lot of attention. Between VANilla and Texas plates, clearly I stuck out like a sore thumb, thus she asked, “Are you trying to get to 30?” Of course, I didn’t know – my ultimate road was 711 and there were so many turns in between that I couldn’t remember, and she said well a truck has jack-knifed on the detour up ahead, so you can’t get through. You need to turn around and take the following roads. Can you believe it!!! When is the last time someone has gone out of their way to ask if you need help with directions?!? It was totally awesome. People in small towns are just plain nice. I didn’t stop in Ligonier but it was the starting point on 711 from which I drove to Fallingwater, a home designed by Frank Lloyd Wright in 1935 for Edgar J Kaufmann, the founder of now Macy’s. The tour only allowed photos of the outside of the house, and it was truly magnificent. The only way I can really do this home justice is to say, GO VISIT IT and MAKE A RESERVATION! Frank Lloyd Wright was so far ahead of his time. 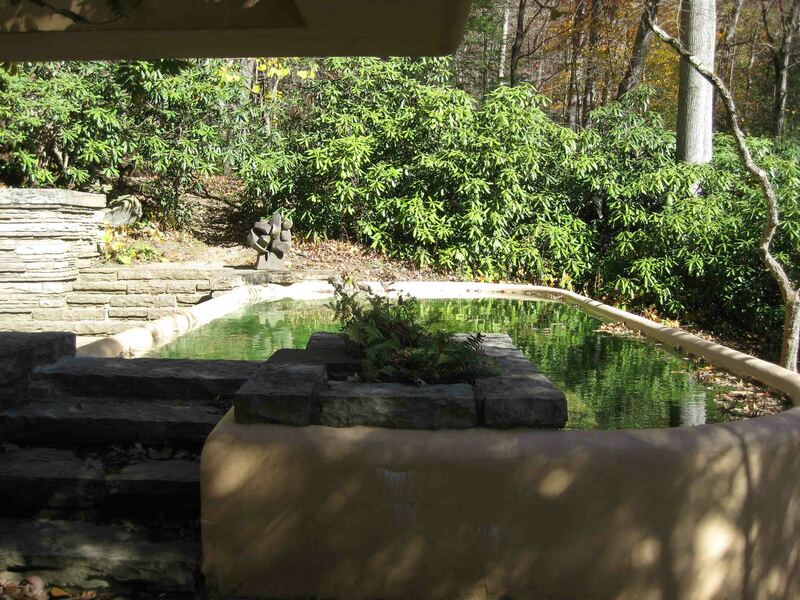 He was in his 60s when he designed Fallingwater. Given all the technology today, the home, built into the side of the mountain and over a waterfall might not sound that impressive, but the fact it was built in 1935 for $155,000 makes this masterpiece astonishing. A regular three bedroom home at this time could be built for $5,000, and the design of a home at this time certainly wasn’t as modern. 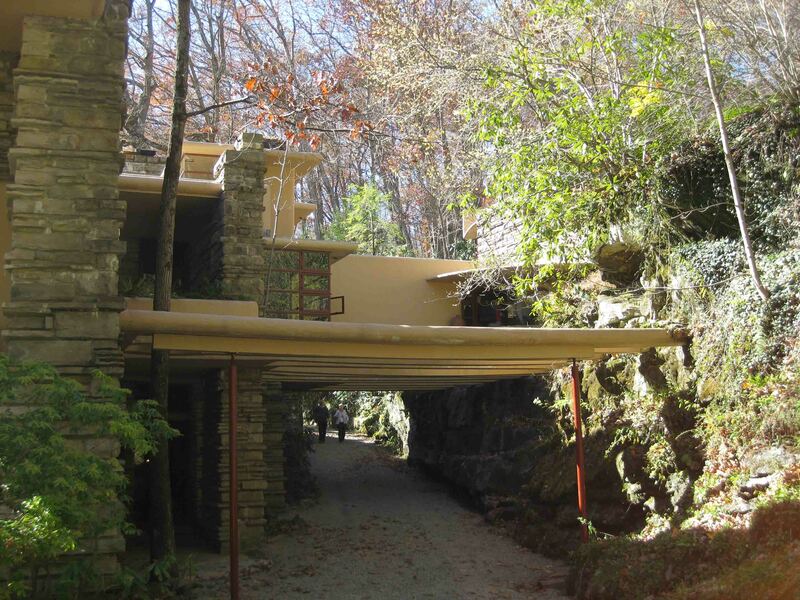 Fallingwater has an appearance of being built in the 1970s, some 35-40 years after the original construction. The house is constructed with cement, stone, and iron. All the stone used in the construction was taken from the property. No detail is spared. The grain of the wood on the cabinets is horizontal while the grain on the doors is vertical. The glass of many of the windows is mitered to the stone. The corner windows open from the corner to each side so that the view could be perfectly clear of any steel. Most of the interior furniture was designed by Wright while the home contains art from all over the world including Picasso’s, Rivera’s and Rembrant’s. The ceilings, though low, rise and fall to always force the view toward the natural outdoors and the terraces account for 50% of the space in the house. At least one chimney and wall are partially formed by the boulders on the mountain with the house built around them. Wright, nature, or modern architecture lover to appreciate this work of art. It might help to visit Taliesin West in Arizona or Taliesin in Wisconsin first though. Both properties served as homes and studios to the architect and now teach his ideas. I visited Taliesin West with my friend Debby last February and I must say it was nice to visit Fallingwater with an understanding of Wright’s approach to architecture. I think this is definitely a “top ten place to see before you die”. I met a handful of people on the tour too. Dean, an owner and operator of 24 McDonald’s, was at a convention nearby. 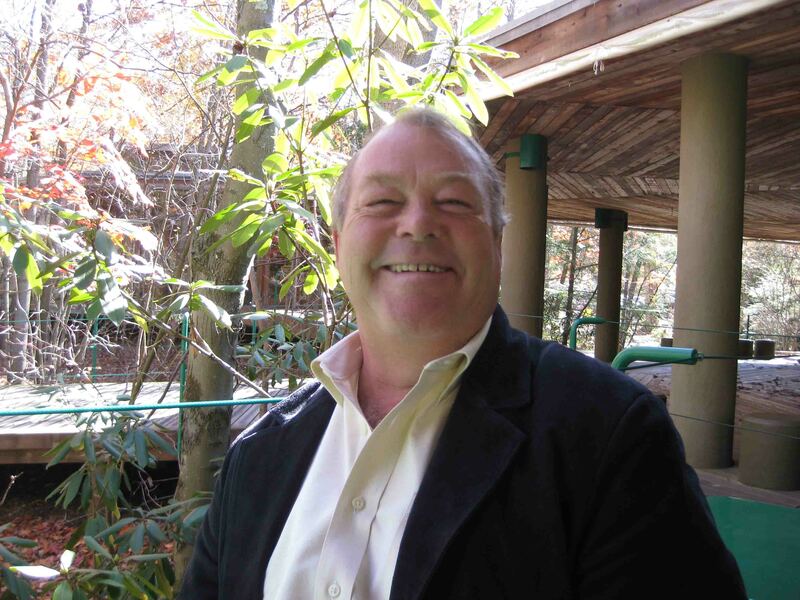 It sounded like the resort where he and the rest of the convention goers were staying was fantastic – golf, exotic animals, and other adventures. I also met Amber and her grandmother, Melva. Amber had a class that was studying Fallingwater, so she came to see it. Melva was curious to know what I thought about going on the tour by myself. To me, I was on the tour with a bunch of people compared to being on the road by myself. They were from Maryland…who knows maybe I’ll bump into them again next week! It was after lunch and the dogs hadn’t gotten their “long” walk yet, so we visited Ohiopyle State Park. 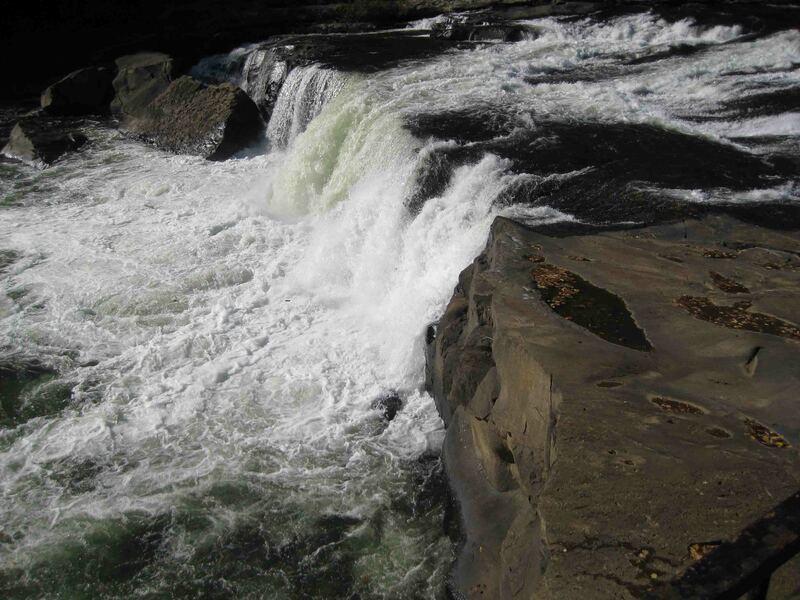 The park is home to Ohiopyle Falls where the Youghiogheny River pours over large sandstone rocks. The falls area, once a hunting ground for the Shawnee and Iroquois Indians, was originally named Ohiopehelle, meaning water whitened by froth while the river was previously called Yohoghany meaning a stream flowing in a roundabout course. The area was also inspected by George Washington in 1754 while he was looking for a waterway for his troops. However, due to the elevation of the riverbed dropping about 90 feet within 1 mile, an alternative route was used. 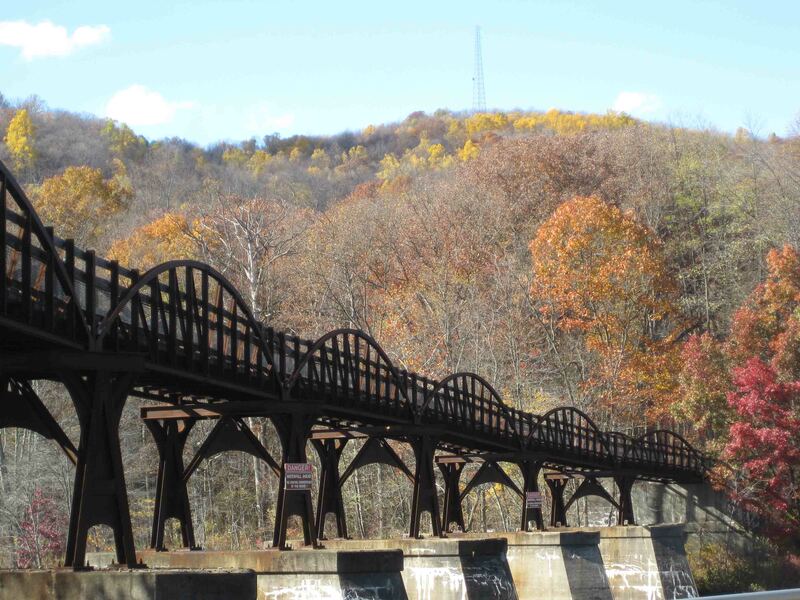 Scout, Petey, and I walked along the falls area and then across an old bridge that was used by the Western Maryland Railroad beginning in 1914 through 1975. Now the bridge serves as a footpath to Ferncliff, a peninsula of land full of trails for walkers and cyclists. Though relatively breezy, it was another glorious day of sunshine! Between the time we spent at Fallingwater and Ohiopyle State Park, it was already 3:30 pm. I ventured on to Somerset in hopes to stop at the Historical Center, a complex that hosts early American activities. Unfortunately, I arrived a few minutes after 5 and it was closed. I had planned on staying in Somerset for the evening, but I wasn’t ready to settle down for the evening, so I weaved around the tight curves and steep hills to Bald Knob Summit. I managed to miss the only pullout for a picture, but stopped when I got to lower ground to get another picture that doesn’t do the fall foliage justice. 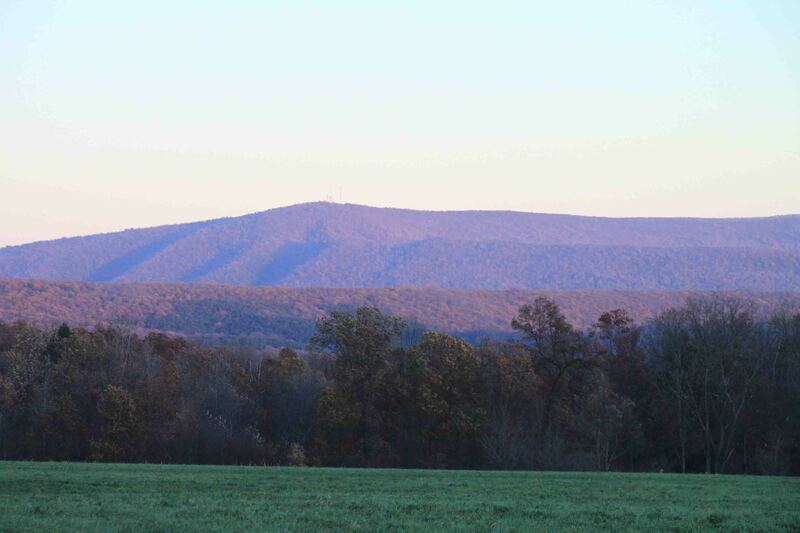 The overlook I missed provided a view of rolling green pastures, golden wheat fields, and farmhouses with a backdrop of crimson red forests covering the mountains of Maryland and West Virginia. 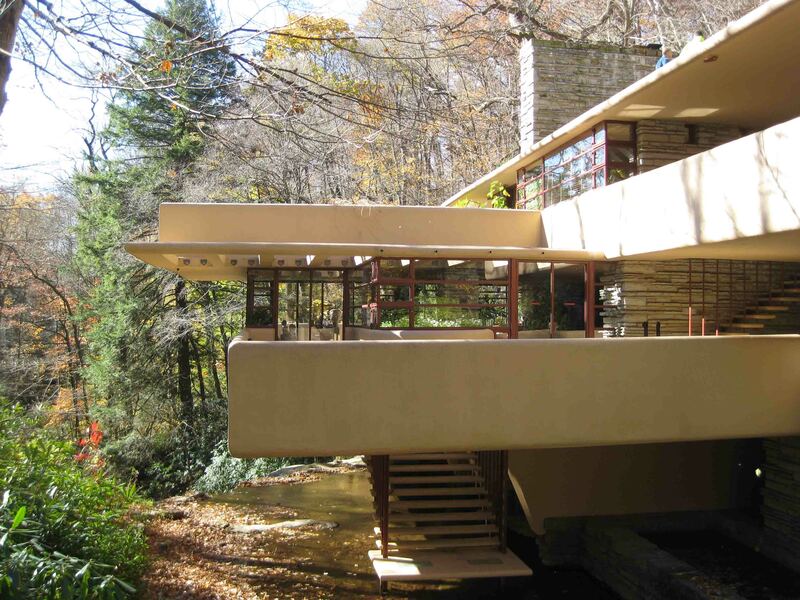 Well, I have to put Fallingwater on my “must see” list. It sounds fascinating and your pics are great! Ranger game was PITIFUL! Lost count of the runs WALKED in — think it was 4. Final score 9-1. Game 3 (Friday) has an early start 6:30. Maybe if you watch you will bring them luck! 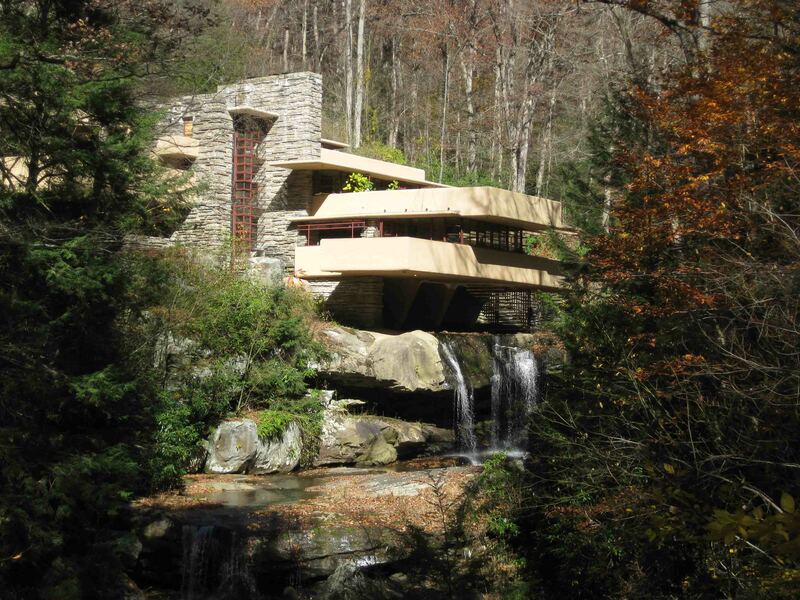 I’ve watched a documentary on Fallingwater, but would love to see it in person. So cool! So it takes a reservation to get inside? Glad you finally got out of the rain. Stay safe..
Well I had to wait 45 mins. On busy days I would say yes. Great pics. The house is wonderful, not my taste but I’d love to see it even if something is not my taste I can still appreciate the art involved. The first pic of the whole house might be one you want to keep for you pic of the state. So, neat your meeting so many interesting people. Just so you know, I’ve pulled over and asked many of out of state people if they needed directions (usually before most people had GPS’s), but if I see an out of state plate & some one looks perplexed I ask, you never know. Be safe. Not really my taste either, but the details are incredible. You are nice to give people directions without them asking!